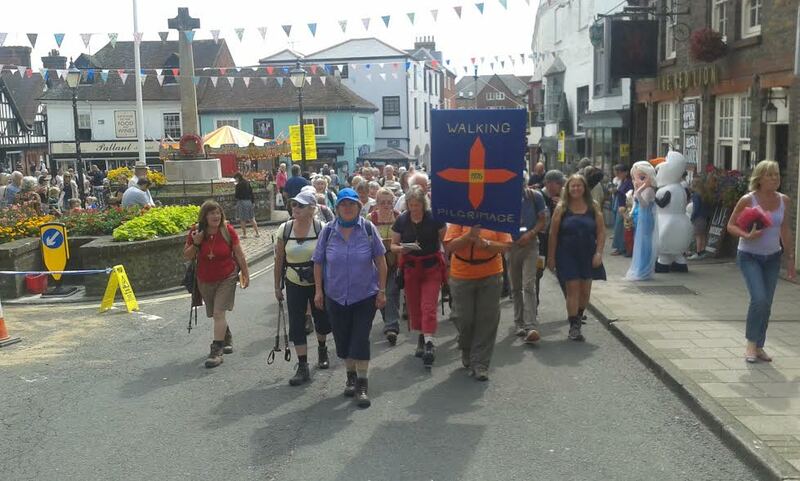 The Diocese of Arundel & Brighton Ecumenical Walking Pilgrimage celebrated its fortieth birthday in 2015. The pilgrimage was originally conceived as a one-off initiative to ‘beat the bounds’ of the then 10 year old Roman Catholic diocese which covers Sussex and Surrey (outside Greater London). On Easter Monday 1975 a group of 35 pilgrims, led by three diocesan priests, walked 240 miles around the perimeter of A&B Diocese starting and finishing at the cathedral at Arundel. The pilgrimage was such a success, that a second, and subsequent pilgrimages were planned. The first ecumenical pilgrimage was made in 1981 when the A&B diocese and Anglican diocese of Chichester walked together at the invitation of Sussex churches to commemorate the 13th centenary of St Wilfrid’s conversion of the South Saxons to Christianity. In the intervening years the Pilgrimage has walked all over the country; to Winchester, Chichester, Carlisle, Lincoln, Lindisfarne and Bath to name but a few. The pilgrimages have continued as vibrant ecumenical events enjoying and learning from the riches of different traditions and engaging with differences of custom, understanding and expectation. The walking pilgrimage is now organised by a lay committee of past pilgrims who plan a two week ecumenical pilgrimage to a cathedral city, shrine or place of religious interest each summer. During the pilgrimage we explore an aspect of our faith and Christian heritage in reflection and discussion. Typically we walk 15 miles each day on footpaths rather than roads, stopping to reflect at churches that we pass, sometimes joining the congregations for parish services. We picnic or stop at a pub for lunch and sleep on the floors of church, school or community halls. Pilgrim numbers are usually between 60 and 70, many of whom will walk the pilgrimage in its entirety, while others will join for a day or two. What we rediscover, year after year, is the amazing personal and community value of making a pilgrimage where the journey, walking, laughing, sharing, praying and singing become as important as the destination. What we rediscover, year after year, is the amazing personal and community value of making a pilgrimage where the journey, walking, laughing, sharing, praying and singing become as important as the destination. Planning a pilgrimage requires some key considerations: where will you go, how will you travel, how long will you be away and where will you stay; how many people will you be, and will there be an explicit, shared reason for the journey? Are you continually praying about these things? Ours is a walking pilgrimage and planning is a year-long task. We have a number of defined responsibilities that include the chief route planner, accommodation officer, treasurer, bookings secretary, chaplain, church liaison and liturgy teams, catering and support teams and the overall coordinator. A potential route and destination for the following summer is discussed whilst we are still on pilgrimage. The chief route planner will refine this, investigating walking distances and suitable overnight stops and once agreed by the committee the autumn becomes a very busy time for the accommodation officer searching out and booking suitable overnight accommodation. In the spring, each day’s walk is planned, walked out and recorded by a day route planner; effort is made to include historic churches, a variety of religious communities and beautiful countryside. In early summer contact is made with the churches and communities that we hope will welcome us and by late summer the focus is on practical considerations such as preparing detailed route instructions, van hire, equipment testing and the purchase of food. There is a sense of excitement and anticipation as the annual pilgrimage is drawing near. An individual’s preparations for pilgrimage are both practical and spiritual. Each pilgrim is issued with an equipment list; first time pilgrims may need to buy walking boots, waterproofs, a day pack, camping plates and cutlery, a sleeping bag and inflatable mattress. We encourage pilgrims to walk regularly during the summer to ensure that 15 miles per day will be manageable; we also issue a list of physical exercises to practice. Our hearts can also be prepared; our outlook opened, ready to accept communal arrangements, to endure a few hardships and to welcome other pilgrims. We must be willing to be transformed through companionship, beauty in nature and opportunities for private and collective prayer, reflection and discussion. This is spirituality in practice. How can a journey be an act of prayer? What is it to welcome others to a community of faith and life? Where can we build bonds of respect and trust with those of other faith traditions or of none? When can we witness to God’s love for us and to our love for the Lord Jesus Christ? Coordinator, Diocese of Arundel and Brighton Ecumenical Walking Pilgrimages. The 2016 Pilgrimage is from Winchester to Canterbury from August 13th – 28th.